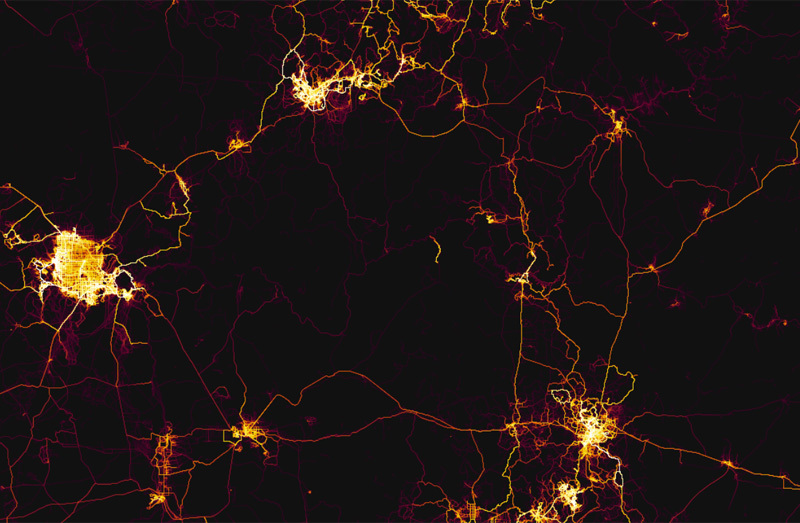 The makers of Strava, a mobile app that allows users to track and share recreational and fitness activities, have created a global heat map that shows where and how their users get outdoors. It’s based on more than one billion user activities (like a hike, a run, or a river trip) representing a cumulative duration of over 200,000 person-years. If you’re interested in the subject, a Strava engineer put together a concise summary of how raw data for the project was worked up. It’s a fascinating, beautiful, interactive map — and when I learned about it, the first thing I did was to see what the Grand Canyon region looks like. The results were so cool I thought I would share them here. 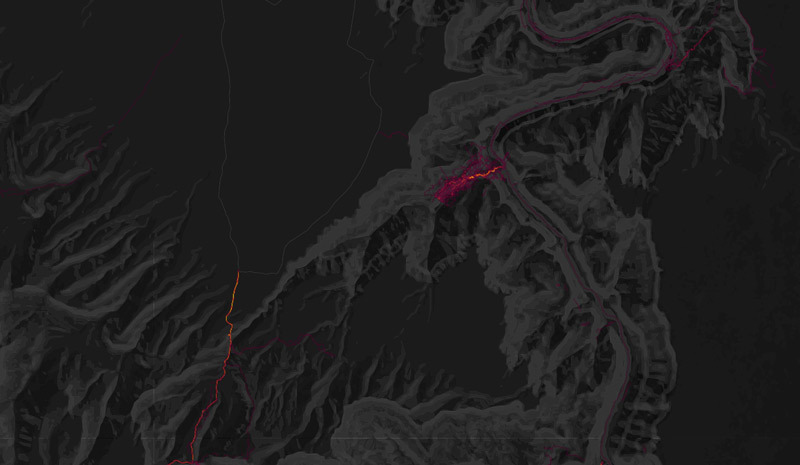 With one exception, the maps below are all filtered to show only running and hiking activities. The final map shows hiking/running, boating, and biking activities. 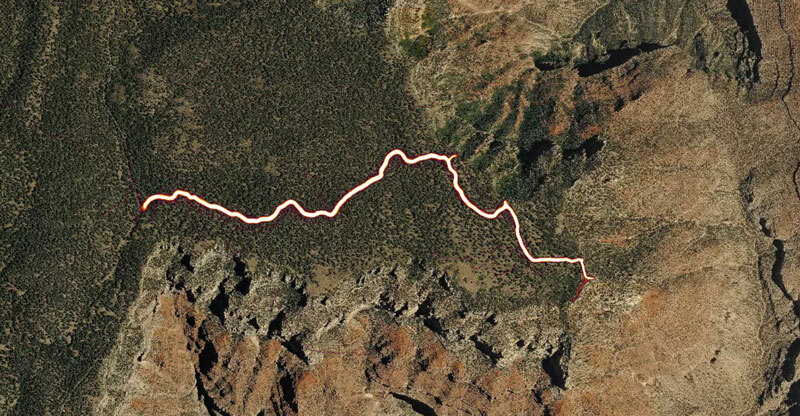 Here’s a close-up of hiking and trail running activity in the central Grand Canyon area. You can see how usage is concentrated in the so-called “Corridor” area — Bright Angel Trail, North and South Kaibab Trails, and the River Trail. Look closely and you can also see where attractions provide popular diversions for corridor users, such as Ribbon Falls. Outside of the corridor, virtually the entire trail network is visible, although it’s less brightly rendered than the corridor trails. (The Tonto Trail west of Boucher and parts of North Bass appear somewhat less brightly “illuminated,” but they are still there). Outside of the official trail network, certain routes are also visible. 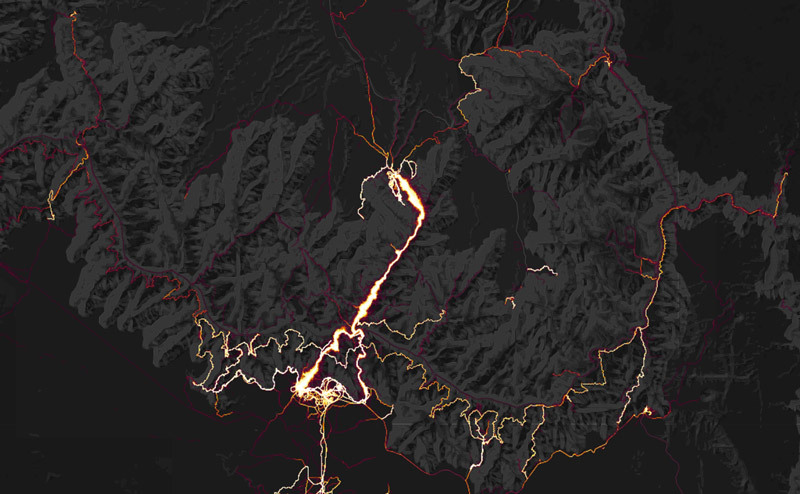 The route between Salt Canyon and the LCR/Colorado confluence receives a surprising amount of relative visitation, at least among Strava users. Here’s the Bright Angel Trail on its initial descent into Grand Canyon. 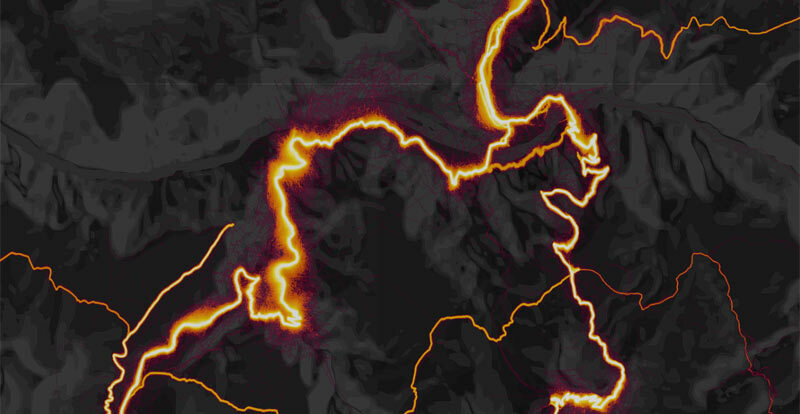 Even without understanding how and why Strava engineers worked up the data in the way they did, it’s obvious that Bright Angel Trail gets a lot of use. If you’ve been to Grand Canyon National Park, this map may reflect your experience on the trail. The rim of the canyon is well defined by the rim trail, and the little spurs jutting into the canyon correspond to frequently visited overlooks and viewpoints. Along the Bright Angel Trail, near the top of the image, you can see a little sideways V- or Y-shaped spur. That corresponds to the restrooms at 3-Mile Rest House and the nearby Redwall overlook. Let’s look at something a little farther to the west. 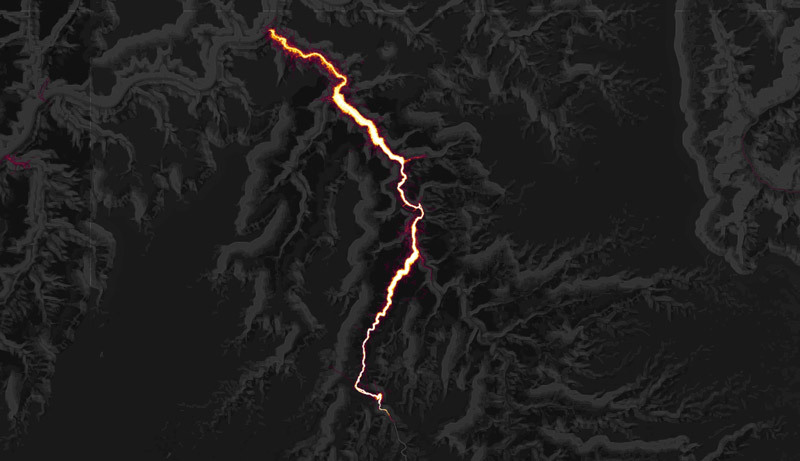 This bright “lightning bolt” is the result of visitors hiking into and exploring Havasu Canyon. This area gets a lot of use, but it’s all concentrated along one route that stretches from rim to river. In reality, this reflects two distinct sets of visitors: Those who hike down from the rim, and those who hike up from the Colorado River. On the Walhalla Plateau, there’s virtually no pedestrian use on paved roads. This isn’t surprising: The roads are narrow and in many places the road shoulder is practically non-existent. Consequently, some hiking trails appear isolated from other recreational use. Shown here is the trail to Cape Final. This isn’t the most dramatic image, but it shows an interesting phenomenon. This is the (lower) Saddle Canyon area, and the surrounding part of Marble Canyon. Visitation at Saddle Canyon is focused near and emanates from the drainage’s confluence with the Colorado River. This is likely due to it being a popular side-hike destination for river trips. And here’s a triptych of images showing a few places where hikers have caused trail braiding, social trailing, or have apparently gotten lost. On the left is Horseshoe Mesa. In the center is Tanner Trail where it meets the Colorado River. And on the right is a lower-elevation portion of New Hance Trail. Now let’s back up and look at the bigger picture. Below is the entire Grand Canyon region, showing all types of use (including biking and river running). 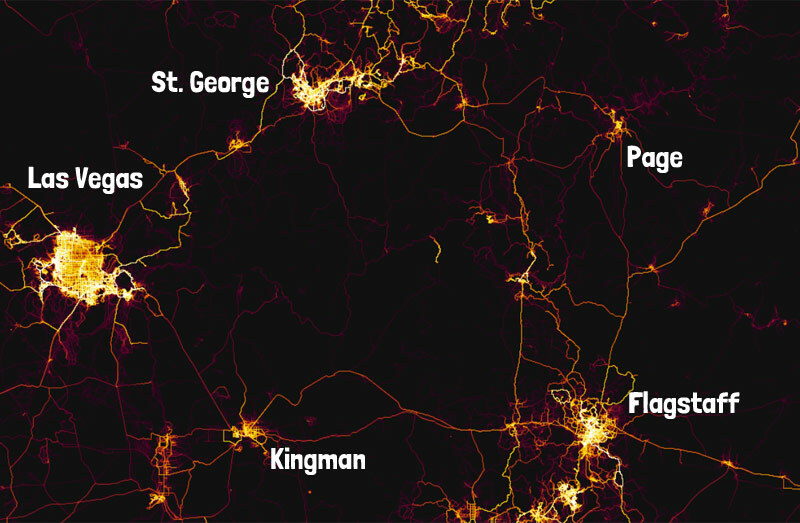 Clockwise from left, you can see Las Vegas, St. George, Page, Flagstaff — with nearby Sedona and Williams — and Kingman. (Click here for a labeled version of the image.) The Colorado River is visible as a faint purple trace through the dark center of the image. North of Page, the individual bays of Lake Powell are visible as faint purple traces where they were explored by boaters. 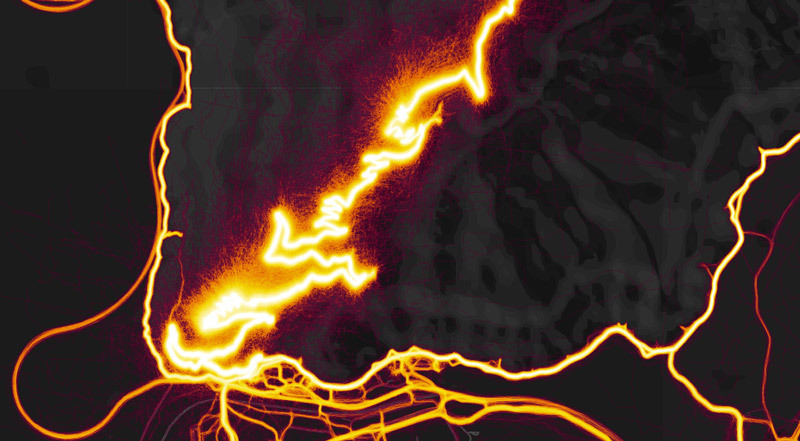 To see more of this, go check out Strava’s gallery of heat map images from across the world. Or explore the global heat map on your own. No doubt some of the data in the Grand Canyon region comes from my friends and clients. If you’d like to explore these places in person, drop me a line. Neat maps, but I think you’ve misidentified Kanab on the labeled version of the regional map. That’s actually the St. George area. Kanab is the much smaller activity concentration midway between St. George and Page. Good catch, thank you Chris! I’ve updated the post. I believe the area marked Kanab is really St. George, Utah. Kanab is a small bright spot east of that. Vivian, thanks for also catching this! Labels are corrected now.